'Oh no, it's raining outside! I guess I can't go riding." Wrong! 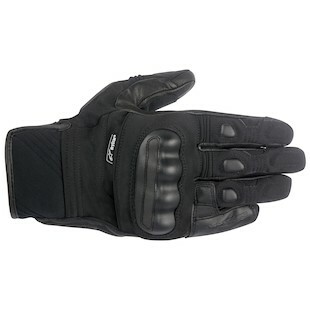 With the new Alpinestars Corozal Drystar Gloves, you don't have an excuse anymore. With these gloves, Alpinestars set out to create a glove that won’t hurt the wallet but that still uses their waterproof Drystar technology. So, what you get are a short cuff option that are meant for the days when the sky needs to cry (Which you won’t need to do because you’ll be out riding). However, if you did need to wipe the tears away, these puppies come with a visor wiper on the thumb. The Alpinestars Corozal Drystar Gloves also come with stretch polyamide fabric on the upper part of the glove for flexibility and comfort and the palm is goatskin leather for added protection. The protected outside stitching is a definite bonus especially at the price point. The Alpinestars famed 3rd and 4th finger bridge is also included to keep the pinkie attached and happy. They will also help you stay connected to the world via a touch screen compatible fingertip on the index finger. Alpinestars has been in the game long enough to know that there are riders out there who aren’t bothered by a little bit of rain. They also know these people depend on quality gear to make their riding experience enjoyable. The Alpinestars Corozal Drystar Gloves are designed to do just this. Now stop crying and start riding.